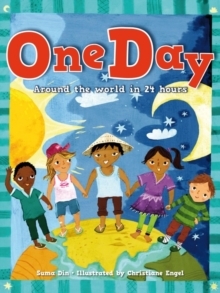 One Day follows fifteen different children from around the world through a 24 hour period. Not only will readers learn about their different lives and cultures, but they will also discover how time zones work, and what's happening on one side of the world while the other sleeps. This is a fantastic and accessible introduction to the concept of time and time zones for a younger audience. It also containing extra material exploring how time is measured and why.